MELBOURNE: England’s opener Jason Roy recorded the highest-ever one-day international score by an England player as the tourists finally had something to celebrate with a five-wicket win over Australia on Sunday. After their wretched Ashes campaign, in which they were beaten 4-0, the tourists chased down a hefty Australian total at the Melbourne Cricket Ground to win with seven balls to spare in the opener of the five-match ODI series. Set 305 to win, Roy ‘s daring 180 helped England make 308 for five. The successful chase was also a record for a one-day international at the MCG, eclipsing Australia’s 297 for four against England in 2011, and vindicated captain Eoin Morgan’s decision to bowl first. Having been an onlooker for the Test series, Roy was an unlikely hero. But he rode his luck to produce a record in limited-overs cricket for England and also a new benchmark for a batsman at the MCG in a one-day international. 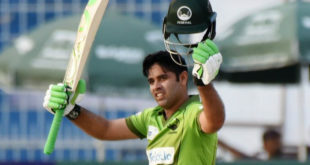 The swashbuckling right-hander lived dangerously throughout his innings, charging along at better than a run a ball and reaching his half-century off only 32 balls. He survived a run-out scare and an lbw decision which was overturned upon review, and lofted several balls just out of the reach of frustrated Australian fielders on the way to his fifth ODI century. Roy was just five when Mitchell Starc could have run him out with a direct hit. He duly punished the Australian fast bowler by taking 14 off his next over as the tourists raced past 50 in the fifth over. He was seemingly trapped lbw by 91 by spinner Adam Zampa on 91, but a review showed the ball hit him outside the line of off stump and the decision was overturned. Roy wasted little time making the most of that piece of fortune, driving the next ball just over a leaping Aaron Finch on the long-on boundary for six. He reached his hundred just moments later from 92 balls, with nine fours and three sixes. Fittingly, the 27-year-old passed team-mate Alex Hales’s England record knock of 171 against Pakistan in 2016 with a chip just over the head of a despairing Australian fielder. He finally fell to Starc after skying one into the outfield, having faced 151 balls — hitting 16 fours and five sixes. Roy was still coming to terms with his achievement after the match. “Incredibly special, I don’t have too many words right now,” he said. “Halesy was pretty disappointed.” Australian captain Steve Smith praised Roy for his bold knock. “He didn’t give us a chance, and he chanced his arm,” Smith said. “They got off to an absolute flyer and we couldn’t pull them back.” Roy had a willing partner in Test captain Joe Root, who had been tormented all tour by the Australians and was in no mood to let a rare victory slip. Root made an unbeaten 91 and he and Roy put on 221 – an English ODI record – for the third wicket. Aaron Finch’s ninth one-day international century was the cornerstone of the Australian total of 304 for eight. Finch’s 107 was backed by half-centuries for Mitchell Marsh (50) and Marcus Stoinis (60) as Australia recovered from a shaky start in which the tourists finally managed to get bogeyman Steve Smith cheaply. Fresh from scoring three centuries as Australia won the Ashes 4-0, Smith looked in commanding touch again as he scored at better than a run a ball, but was caught behind off spinner Adil Rashid for just 23.